Fence material property comparison chart, fire, sound, wind, cost..
Fencing have assembled the Fence Comparison Chart to help clients choose the right style of fencing for their property. Have you considered all the options. A well designed and build fence is capable of much more than a simple divider. Fencing can improve the look of your property and even increase your home value. 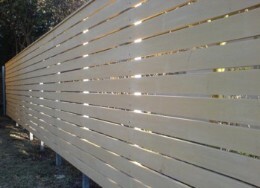 Fencing is an economical way to dress up your home or cure problems such as sound, privacy, security and more.